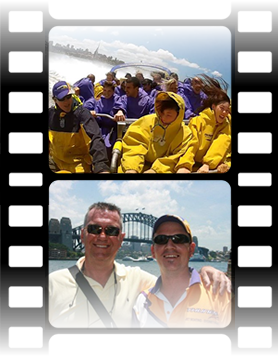 Experience what Sydney Harbour Jet Boating is all about! 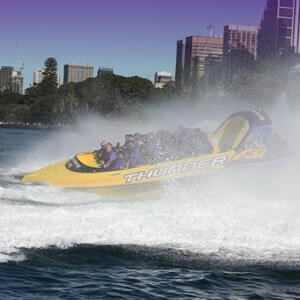 Come along and hop onto Sydney’s BEST Jet Boat ride adventure! 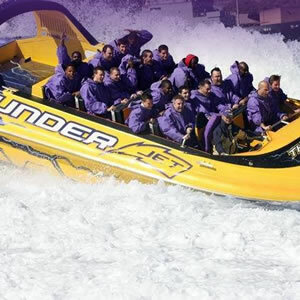 Hop on Tornado or Lightning, our 23 seater Jet Boats for full 360 degree spins! The ‘Extreme Adrenaline’ Jet Boat Ride will take you past the Opera House, Harbour Islands (Clark & Shark), and the exclusive suburbs of Rose Bay, Watson’s Bay. Then onto Sydney Heads for a taste of ocean air! On return we’ll take you past Taronga Zoo and under the Harbour Bridge, by Luna Park Sydney. What Makes Thunder Jet The Best? Most Modern, Safe and Advanced Design! Get a video of your own ride! Group Discounts and Party Rates! Check Out Our Discount Combo Packages To Other Sydney Attractions! Buy a Gift that they’ll never forget!